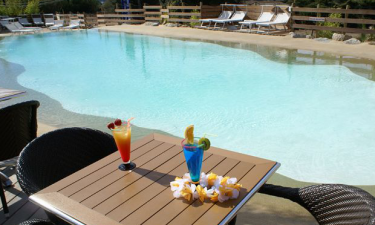 Set right on the edge of the stunning Valinco beach in South Corsica, Le Colomba offers families an excellent range of facilities and amenities to make use of. When you book through LuxCamp, your place in the sun is guaranteed. The site’s close proximity to the city of Propriano means that guests at Le Colomba will never have to go far in search of entertainment. While exploring interesting museums and other historical attractions is made very easy, the onsite staff also offer special excursions for people who want to explore the rest of the city of South Corsica. 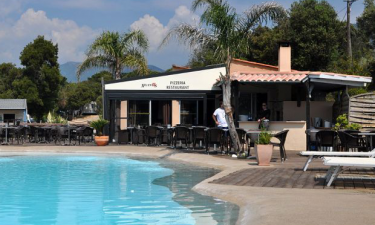 Why choose Camping Le Colomba? Guests can wander from their mobile home and reach the beach in a couple of minutes. This long stretch of golden sand offers plenty of space to spread out on and is a safe place for the little ones to play. Kids can get wet and go wild in the splash pool located in the heart of Le Colombo. 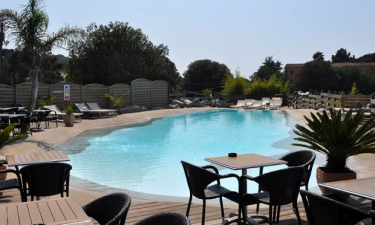 Adults who simply want to unwind during their camping holiday will find plenty of comfortable sun loungers surrounding the main lap pool next to the splash pool.